Irish hockey officials have launched a last-gasp funding drive to try and ensure the presence of the country's men's team at the Champions Challenge event in Argentina next month. Earlier this week, the Irish Hockey Association announced that the team was being withdrawn from the event. 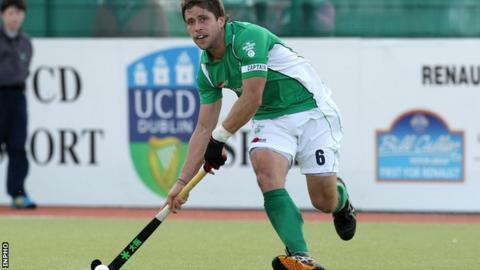 However, on Friday an Irish hockey statement revealed attempts to secure £36,000 to compete in Argentina. The statement said that the money must be raised by this coming Tuesday. The Irish governing body's announcement of the withdrawal from the event had caused widespread anger within hockey circles in Ireland. In Friday's statement, the Irish Hockey Association apologised "unreservedly to all fans of Irish hockey and in particular the senior men's squad for the upset, disappointment and anger caused by the announcement". The statement said that the decision had been taken "as a result of a number of factors". These included the cost of the trip to Argentina and the fact that as of now, Ireland does not have a men's coach following Paul Revington's exit from the job in the summer. "As we plan for the last quarter of the financial year, it is evident that the association will finish the year with a significant deficit if the trip to Argentina goes ahead without any additional income being generated." The statement added that the Irish men's team "have brought huge pride to Irish hockey and continue to do so, rising to a world ranking of 15". "The board wants the work that the squad and their support staff have put in to be rewarded but the unfortunate position in which we find ourselves makes Argentina financially unviable, unless we can raise €45,000 (£36,200). "The FIH has given us until Tuesday evening next to confirm or otherwise our participation at this event. "The board want the squad to participate but need the help of the hockey public in getting them there." A web page has been set up for fans to make donations while the Irish hockey has also asked for any suggestions on methods of raising money for the Argentina trip. Friday's Irish hockey announcement included a statement from national men's skipper Ronan Gormley who also appealed to the sport's fans to support the fundraising initiative. "The board have apologised and have committed to us that they will sit down once we have completed the Champions Challenge phase and address any unanswered questions that remain," said the Ireland captain. "In the meantime we have an opportunity to fund the team to travel and compete in Argentina. "Help us to fund the trip to Argentina. We will keep working and training to improve, keep breaking barriers and keep pushing towards our World Cup and Olympic dreams."